Everybody's comin', leave your body at the door"
Autumn! Pomegranates hang heavy on the branch, darkness comes early and crisp, while pumpkins await ghoulish transformation on the front steps. Best of all, it is time to prepare an altar for Dia de los Muertos! My introduction to the ancient Aztec/Spanish Catholic celebration began in 1992, just a few months after the death of our sister Maria. One fall morning I opened my ornate brass post office box to find a single while envelope. It was stamped with the image of a grinning calavera wearing a wide brimmed hat trimmed with flowers and ribbon, and addressed beautifully by hand in calligraphy. Intrigued, I opened it on the spot. It was an invitation to participate in a Dia de los Muertos show at Gemini Graphics. I knew very little about Dia de los Muertos, just that it originated in Mexico, and was celebrated a few days after Halloween. I began to read anything I could get my hands on, and visited the cemetery in Agua Prieta in Sonora on November 2nd. Something I continued to do for many years until recently when the drug wars and lack of a passport got in the way. 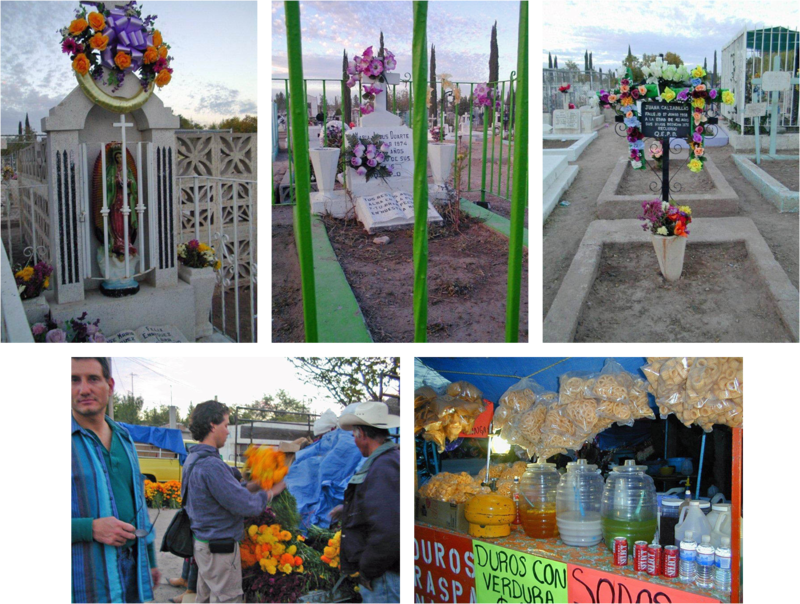 In Mexico, families gather at the cemeteries to clean, paint, and adorn the graves. Night long vigils are held, with plenty of food, drink, and song. Adjacent to the cemetery are rows of vendors selling long stalks of sugar cane, churros, horchata, and tacos. Styrofoam crosses wrapped in layers of satin ribbon and adorned with plastic flowers are stacked like Dominos. The beds of old trucks are piled full of gold or orange marigolds and scarlet cockscomb. Faded flowers from the past year spill over the sides of overloaded trash cans. Color, primary and pastel is everywhere. One of the most surreal things I've witnessed was a group of men unloading large rough hewn crosses and carved figures of Jesus from a truck. One man would put the cross on the ground, and another would place Jesus into position - then start nailing him to the cross. I began working on my first altar with a chalky cow pelvic bone that I had found in the desert outside Florence and some peacock feathers for inspiration. A few weeks later I had created La Gargola de Bisbee. I set the altar with candles, vodka, photographs of my dead loved ones, and a box of See's Assorted Chocolates for my Nana. I took a tiny bite out of each one, then placed it back in the brown wrapper inside the box, just like she used to do every Christmas. It was very cathartic. There is really no way to describe completely how much the Mexican customs and traditions regarding death helped me with my own personal healing process! The way death is viewed was completely contrary to everything I had previously experienced in my own culture. It seemed natural, beautiful, and ironically life affirming! Skeletons left on altars are meant to be whimsical and mock death, not to be scary. Dia de los Muertos is a celebration of the dead, NOT a mourning of the dead. And it has nothing to do with Halloween! On November 1st and 2nd it is believed that the veil between the world of the living and the dead is lifted. The dead are able to return home to be with their loved ones and elaborate altars are set up to welcome them back. Candles are lit to warm their hands, favorite foods and drink are set out to refresh them after the long trek back to the world of the living, and scented flowers and copal incense are used to attract them. Sugar skulls, bowls of salt (the spice of life), and pan de muerto (bread of the dead - the staff of life - a sweet round loaf decorated with bones) are some of the traditional offerings placed on the altars. After that first altar I was hooked! Thus began my journey of discovery that is still going strong all these years later. Come August my mind turns to creating new ways to celebrate and honor my dead loved ones. I have made many altars and hundreds of sugar skulls, calaveras, and bottled spirits - and every year I look forward to the creation of more. 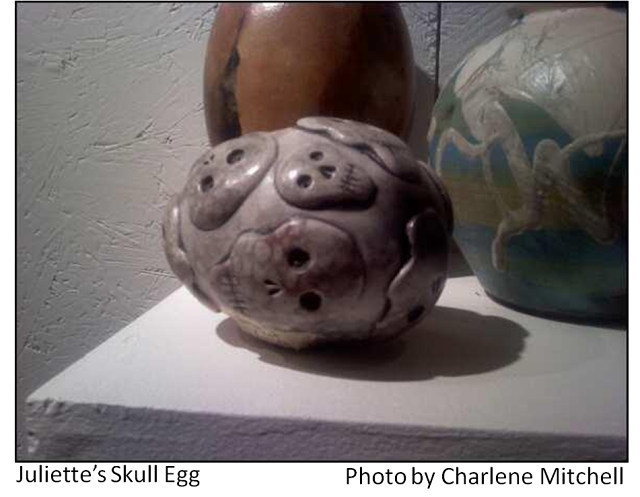 This year I was inspired by my new ceramics class and made several skulls of clay and an egg with skulls. 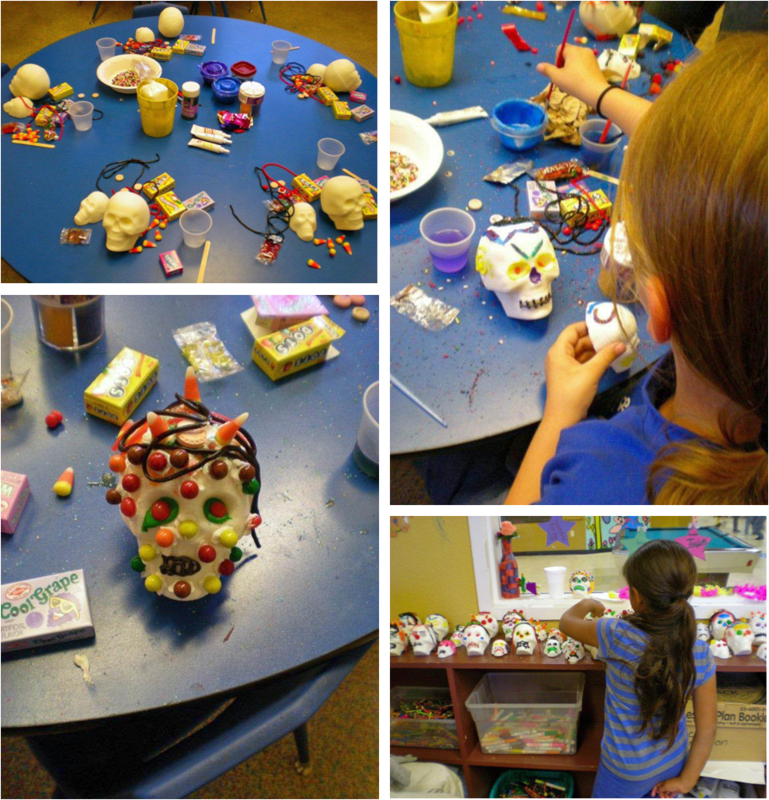 Two years ago I did a sugar skull decorating workshop with the children of the Boys and Girls Club that was a lot of fun. While some of the kids were obviously in it for the mounds of sugar and candy involved, others got the underlying meaning and created touching tributes for their loved ones. Other years I have created community altars where the public is invited to leave photos, trinkets, food, flowers, or notes for their ancestors and friends. I have done many different things, some public, some private over the past 18 years to commemorate these magical days - all of them hold a special place in my heart. Dia de los Muertos has crossed over the border as more people in the States embrace the custom along with their neighbors from the South. If there are festivities happening in your area I strongly recommend that you go check them out! I also suggest reading The Skeleton at the Feast by Elizabeth Carmichael. This year I invite you to set up an altar of your own, however simple, and experience this extraordinary tradition for yourself. I cast each skull in a mold with a mixture of cane sugar, meringue powder, and water. The mixture is immediately turned out of the molds and left to dry until they are hard enough to handle. The center of each part is hollowed out so that the remaining sugar mixture can dry to a durable, rock hard state. If using a two part mold the pieces are then joined together with an icing made of powdered cane sugar, meringue powder, and water which makes what is known as Royal Icing. After this has dried properly the skulls are then adorned with Royal Icing in a variety of colors and design. Some feature traditional themes with foil banners that bear the name of dead cultural icons, celebrities, or family members (i.e. Mijo, Mija, Madre, Padre). I sometimes mix cultural themes. For example last year my interest in the Celtic "Green Man" found its way into my Dia de los Muertos designs, and the resulting skulls featured many leaves... leaves as eyebrows, mustaches, beards, and even teeth! In addition to the traditional decoration of flowers, sequins, foil, I incorporate found objects into some of the skulls: coins, bottle tops, buttons, etc. I cannot tell you exactly what designs this year's "batch" will feature as it sometimes manifests from my subconscious, current events, or various cultural influences as I hold the icing in my hands. My basic concept is a modern twist on the traditional craft. Because each is made entirely by hand there are never any two that are exactly the same. 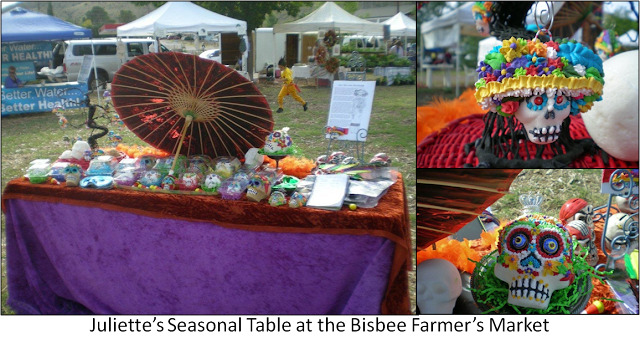 If kept dry and out of direct sunlight sugar skulls will last for many years. 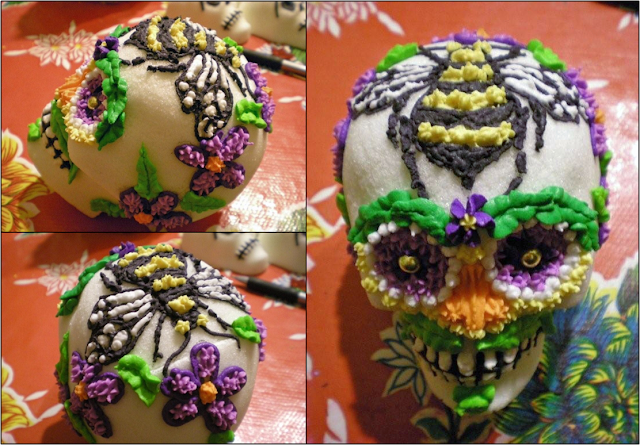 There are sugar skulls in my collection that I have had for man than ten years. After several years the sugar skulls develop a sort of waxy golden patina, and the bright colors will fade to pastel. Just like life itself, they are fragile and finite. For many years I have been collecting various bottles from the old Bisbee dump located out by the County Jail on Highway 80. Several years ago I was inspired to decorate them with skulls, rib cages, and banners bearing the names of who is depicted on the bottle. I call them "Bottled Spirits". I like the idea of giving something "dead" and discarded a new "life". The sculptural details are hand formed from Sculpey, painted and sealed with acrylic, and adorned with vintage findings, sequins, glitter, broken vintage jewelry, etc. Chiltepin bushes grow anywhere from 3 to 9 feet and are easily identifiable when fruiting. The small pepper bulbs dot the plant in a frenzy of red. The chiles are tiny, pack a wallop of heat and yet are very flavorful. Instead of using dried and ground chiles, you can also add fresh roasted Hatch green chilies, which are also in season, before blending the soup until smooth. 1. Cut the pumpkin into wedges, remove and discards seeds or save for another use. Steam the wedges until soft. Cool and scrape pulp from skin with a large spoon. 2. Place pulp in a large stockpot and cover with broth or water. If using water, add 2 bouillon cubes. Bring to a simmer over medium heat. 3. In a skillet, sauté the onion over medium-low heat until slightly browned, about 20-25 minutes. Add onions to soup and cook for one hour over low heat. 4. Remove sausage from casings and add to the skillet. Crumble the sausage with a spatula or wooden spoon, as it cooks. When it is cooked through, set aside for a few minutes until ready to add to the soup. 5. 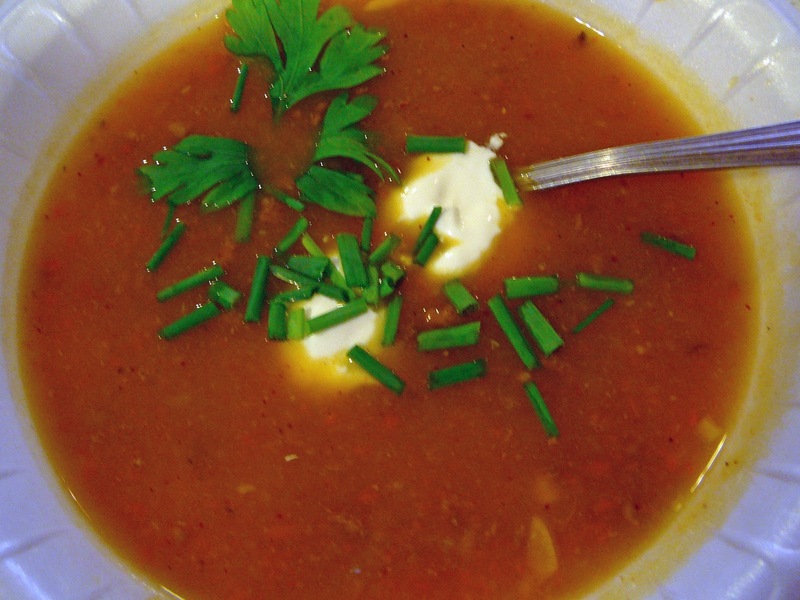 Blend the soup until smooth with an immersion blender. Add the bay leaves and sausage. Adjust seasoning with sea salt, freshly ground black pepper, and cayenne or chiltepin, to taste. Keep the soup on low heat until ready to serve, stirring every once in awhile. 6. Make Mexican crème fraîche, set aside to thicken slightly - it can even be made a day or two ahead. 7. When ready to serve, remove bay leaves. Garnish each bowl with a drizzle of Mexican crème fraîche, and a sprinkling of chives or green onions. If you like, throw on a few hulled pepitas for crunch. I love the things you have put together, Juliette. Especially the spirit bottles. Tomorrow here in Mazatlan, a parade starts about 7 p.m. in the plazuela. Tons of people follow the donkey drawn cart, with empty cups that are filled with beer from the cart. Lots of frivolity, celebration, costumes and the Mexican essential...NOISE. I so enjoy it. The little kids will make them for Tio Noah this year. Nothing he would have loved better than some skull celebration and lots of sugar.